Eli Horowitz, Russell Quinn, and friends. 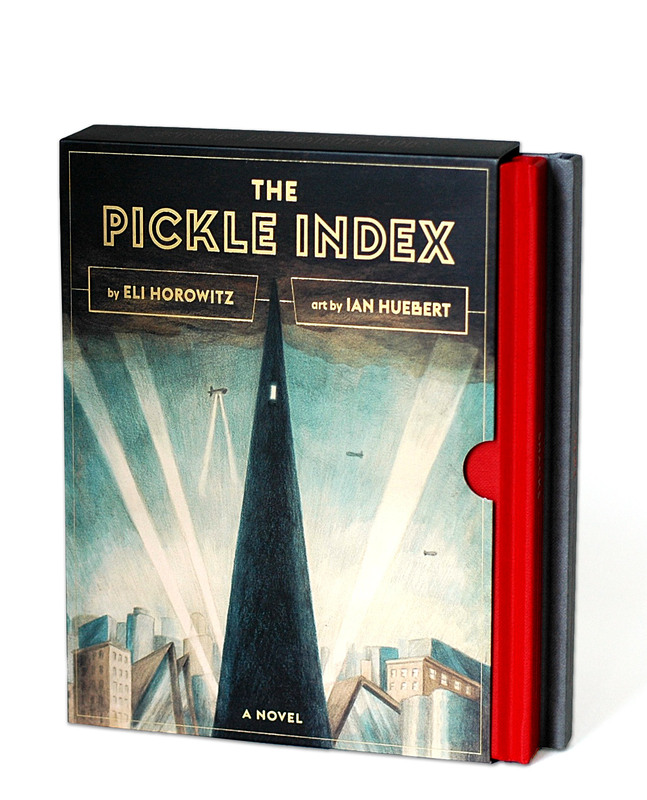 In a glum nation ruled by a stylish dictator, all citizens are required by law to participate in the Pickle Index, a fermentation-based recipe exchange. From within this network, an incompetent circus attempts an unlikely uprising. Thrills, chills, spills, & dills! 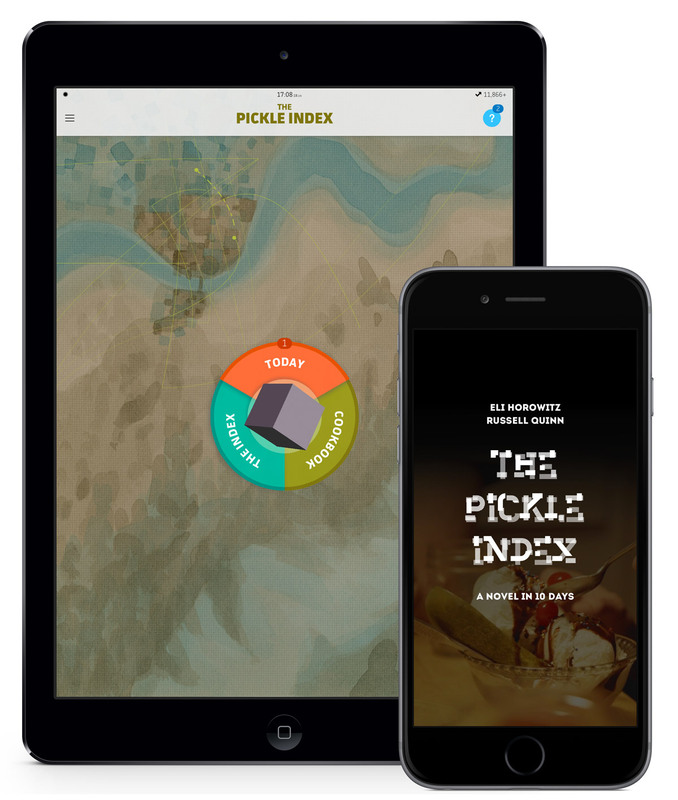 The digital edition of The Pickle Index takes the form of the mandatory recipe-exchange network itself. 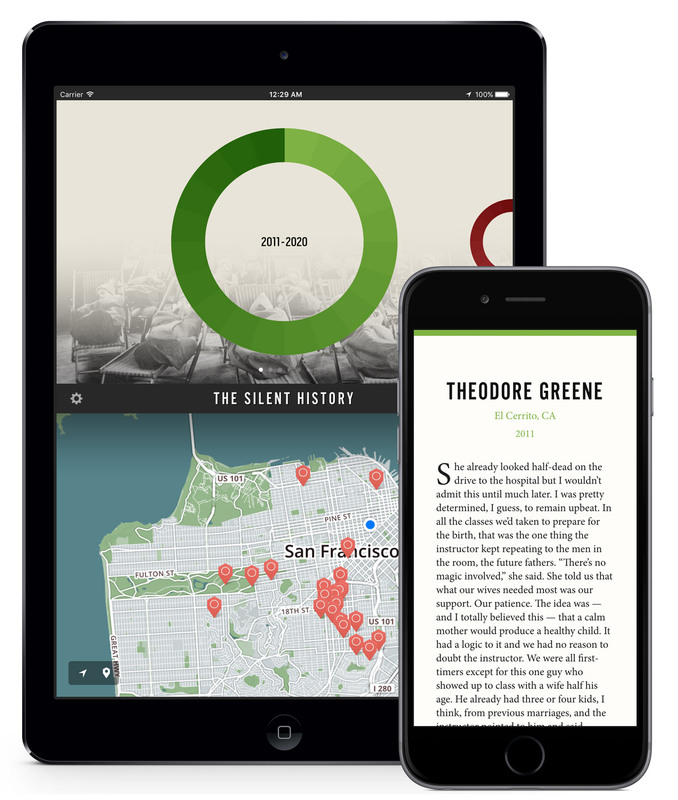 The story unfolds over the course of ten days (both in story time and real time), revealing the narrative through the various features of the app: popular vinegar-based recipes, daily news updates, dynamic maps, and Q&A. The boxed edition consists of two separate hardcovers: one containing updates from The Daily Scrutinizer, an enthusiastic state-sanctioned newspaper; the other collecting misguided recipes from Flora Bialy, the assistant ringmaster of an unpopular circus. By alternating chapter-by-chapter between these two volumes, a single story emerges, as Flora and her collaborators attempt to forestall their leader’s looming execution. Each book features ten large, full-spread illustrations, one for each day of the story; each of these illustrations can be combined with their counterpart in the accompanying book to create a larger unified panorama. Both editions include the full story and are designed as stand-alone experiences. In the early years of the 21st century, doctors begin to notice more and more children being born with a strange condition: silence. No speech, no comprehension, and soon a complete lack of engagement with most human interaction. The kids are seen as not much more than empty vessels, and many are sent to orphanages and group homes — until a teacher at one of these facilities realizes that the children have developed enigmatic, powerful skills of their own. Dr. Jane Cotton is a pediatric surgeon; her husband, Jim, is a humanist chaplain. They are about to celebrate their eighth wedding anniversary when Jim suddenly collapses and dies. Pushing her way into the operating room, Jane finds her husband’s lifeless body — except for his head, which has been removed. Only then does she discover that Jim has secretly enrolled with Polaris, a shadowy cryogenics company in Orlando. Furious and grieving, Jane fights to reclaim Jim from Polaris. Revived in the future, Jim learns he must sacrifice every memory of Jane if he wants to fully enter the new world. Separated by centuries, each of them is challenged to choose between faith and fear, intimacy and solitude, timeless love and a life without end. Touch Sensitive by Chris Ware was first published digitally in 2011, when it was bundled inside the McSweeney’s iOS app. 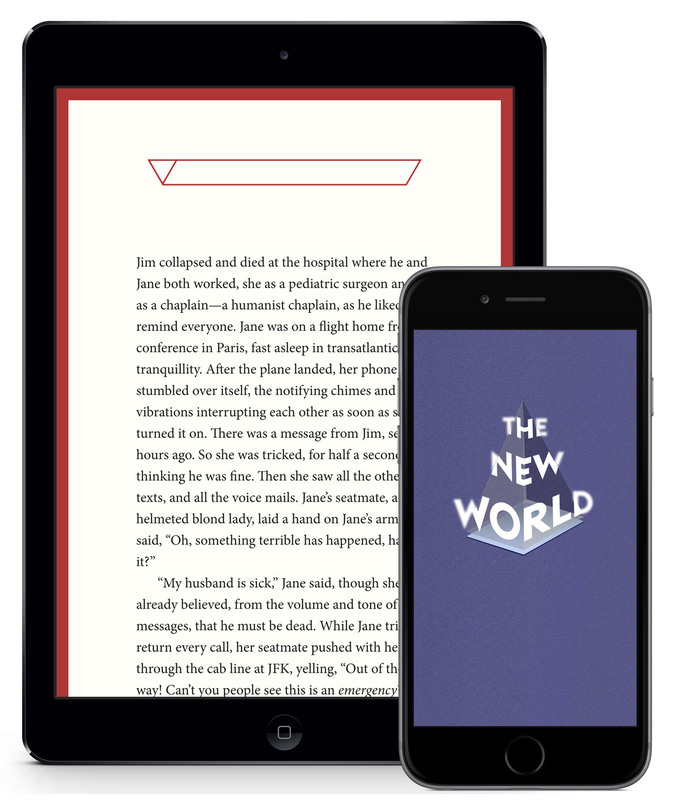 A version of the story later appeared in print as part of Ware’s Building Stories (2012), but the interactive edition has been unavailable since 2013 when the McSweeney’s app was removed from sale. In 2016, the original team worked to rerelease the project as a standalone app, with all original gestures and transitions intact—even though the “swipe” gesture, which then felt natural, now seems a little excessive. Who would’ve guessed? 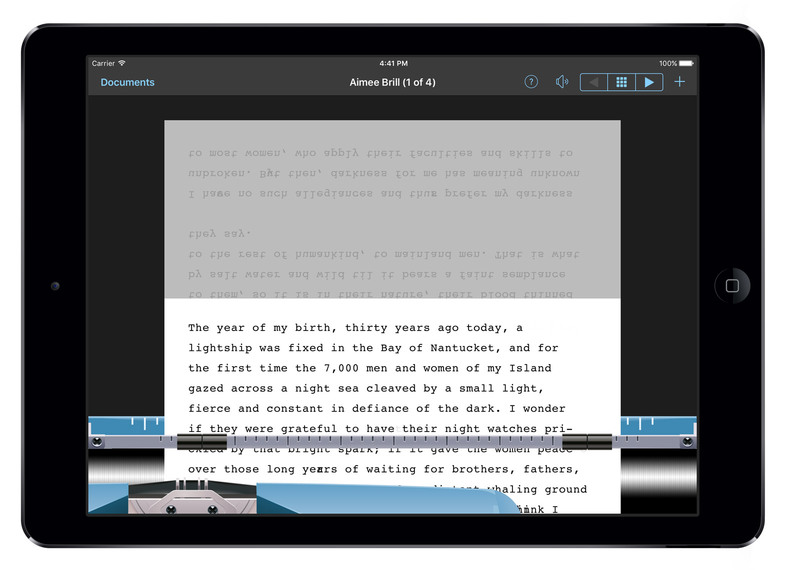 Typing Writer is a functional typewriter designed to help you nail your first draft. Once your ideas are on the page, you can export to your favorite word processor. It comes loaded with first drafts by Jim Shepard, Melissa Febos, Aimee Brill, Tao Lin, Rick Moody, and Eli Horowitz.